Eric Nelson - Mowbray & Son, Inc.
Eric Nelson is a native of Minot, ND. Eric graduated from the University of North Dakota in May of 2010 with a Bachelor of Science degree in Mechanical Engineering. In May of 2010, he was hired as the Project Design and Estimator for the sheet metal division at Mowbray & Son, Inc. 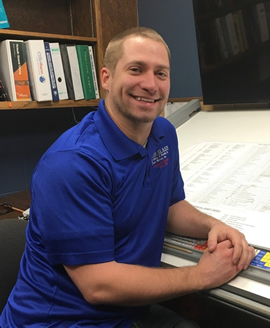 In May of 2015, Eric became a Professional Engineer specializing in HVAC in the state of North Dakota. Some of the design build projects Eric has been involved with include the MAFB Add/Alter AGE Facility, the MAFB Bldg 546 Mechanical Upgrade, and MAFB Clinic Modernizaton. Other projects include the Minot International Airport, the Nedrose Public School, the 4 Bears Event Center, the Mountrail Justice Center, the Ward County Office Building, and the Ward County Jail Expansion.